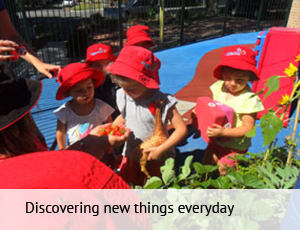 At Mowbray Place Early Learning Centre we believe in allowing the children to be a part of the enriching programs that develop each child to their full potential. 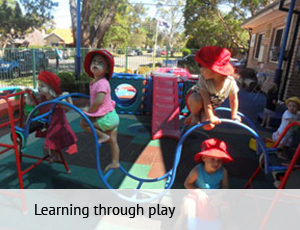 Our educational program embraces the principles of the National Early Years Learning Framework. Using the framework as our platform, learning outcomes are achieved through play and enhanced through intentional teaching. Children are encouraged to make choices and take part in activities while having fun. A variety of individual and group activities, indoor and outdoor experiences are encouraged through the opportunity of planned and spontaneous play. Children are made to feel safe and secure, allowing their natural curiosity and desire to guide their exploration of their environment. The framework is utilised effectively to assist us in providing the children with the opportunities to maximise their potential and develop a foundation for future success in learning. We have a strong belief in creating lifelong learners. Within this framework we recognise that children’s lives are characterised by belonging, being and becoming. In early childhood, play is considered the key way in which children learn. Therefore the program and the environment are carefully arranged so that children have access to a range of resources that challenge to develop new skills or practice recently acquired ones. The curriculum includes regular visits from community groups and role models such as members of the Fire and Ambulance services, Police, Dental, as well as cultural groups, dance productions, musicians etc. This encourages an awareness of the child’s local community, whilst helping them recognise similarities and differences in their lives and the lives of others around them. Each child has their own portfolio that is maintained by their focus teacher. The portfolio contains documentation, photographs and works samples and is able to be viewed by families at any time. At the end of the year each child will receive their portfolio as a memento of their time with us.